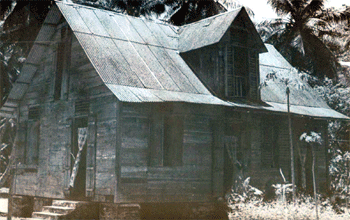 Once upon a time, the houses of the Creole inhabitants of Seychelles were completely different from those of today. TONY MATHIOT ventures back to those early years when those rustic dwellings were beautiful homes for many families. 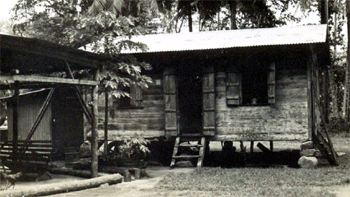 Such is its sinister allure that, when you come across an old sepia photograph of one of those early 20th century Creole houses, you’re apt to feel a spasm of nostalgic romanticism – because it evokes tender images of the perfect tropical idyll which you wished so wistfully you had experienced, but that alas, does not exist anymore. It enchants you, it usurps you, it tortures you like a sentimental song. 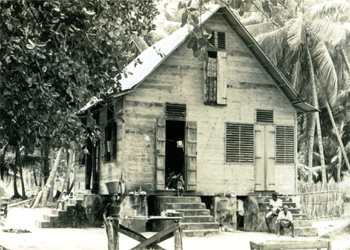 Why does it fascinate us so much to know that, only a hundred years ago, those houses were actually the homes of Seychelles families, our great grand parents? 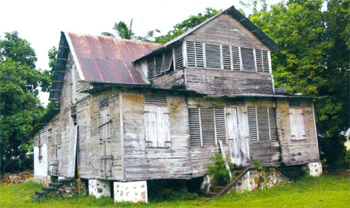 Traditionally, each Creole house had its own distinctive and endearing character although common features like a loft or garret, and a verandah with raffia blinds were compulsory concessions to our architectural heritage. 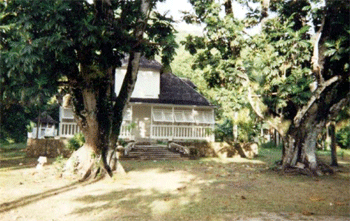 Indeed, our traditionally Creole dwellings date back to the early 19th century. It is legitimately assumed that the French settlers who arrived in Seychelles from Ile Bourbon (Reunion) introduced the Creole architecture in our islands like they did elsewhere in other countries of the French colony such as Martinique, Mauritius and Haiti. The forests of Mahé abounded with hardwood timber like Capucin, bois rouge and Albizzia, while the coastal plateau produced a sufficient supply of Takamaka wood. For at least a century, thousands feet of planks (called madriye in Creole) and beams were obtainable for the construction of houses as the population gradually increased. From the modest timber cottage with thatched roof to the largest and loftiest plantation house, the rustic beauty and the pastoral sublimity of those structures rendered them all picturesquely quaint. They were all architectural icons that testified to the subtleties of our Creole workmanship. As much as we put a premium on the multifarious aspects of comfort and well-being that our modern home offers, there is this peculiar sensation of melancholy envy that compels us to wish earnestly for one of those vanished Creole houses – because such a house evokes arcadian pleasure and rustic contentment. The 1920s… the quadrangular structure rests on masonry plinths in a stretch of clear land at the foot of wooded hills. The hand-hewed casuarina beams that support the ceiling, the ridgepole and rafters and struts, fastened and secured with mortise and tenon, were obtained from hardwood trees that must have been mere saplings the year that Seychelles capitulated to the British for the first time (1793). The artistry involved in the vernacular design of the roofing arouses admiration. The pitched roof of corrugated iron, the rusty finials, the little windows set vertically in small gables projecting from the sloping roof inclines one to think that the carpenter had inadvertently exercised the art of origami when creating the roof-but of course such design was widely used albeit in variations in Creole dwellings throughout our archipelago … and throughout the Indian Ocean. The steps of limestone coral where so many hours of childhood enjoyment must have taken place … five tones … Enid Blyton paperbacks, perhaps also Ludo. The kitchen is an outbuilding, log walls with a stone-flagged floor, the lingering smell of wood smoke, an ash-filled wood stove, cooking pots. A swing hangs from the branch of the mango tree, a brook chuckles as it sweeps by nearby. Leaves skitter across the ground… the distance smell of chicken manure… the shouting voices of workers in the distance… the baying of a dog. How common such a Creole scene must have been, half a century ago. It is absolutely stupefying how the sight of one of those houses – even if seen from a photograph can agitate the mind to such extremes of sentimentalism and romantic idealism. Yet, once upon a time, these cultural treasures were common and ordinary features of residential accommodations for the Seychellois inhabitants. Certainly, they must have impressed those foreign visitors who arrived on our shores aboard ships of the British India Steam Navigation Company. 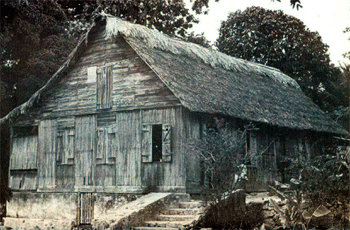 During the 19th century, there were practically no regulations or restrictions pertaining to the construction of residential dwelling in Seychelles. Houses could be built on hillsides, perched precariously on four piles of stones, or on concrete pillars near river banks. On October 12, 1862, many houses in the township of Victoria were washed away in the raging torrents of water when a massive landslide occurred after many days of torrential rain. Most of these were humble little thatched dwellings made of lathing or wood. A few decades after that unprecedented calamity, houses reflected the economic status of their owners – according to their sizes and architecture. This became evident as our agricultural industry gradually began to generate wealth for those landowners who had coconut plantations and vanilla plantations, and later, cinnamon plantations. So the estate building would invariably reflect an image of ‘Plantation Aristocracy’. These fairly huge houses of rustic magnificence which numbered over a dozen were erected on many estates on Mahé and on a few inner islands. Fortunately, five or six of those colonial gems have managed to last to their centennial year, and after undergoing extensive renovations have been declared national monuments – although of course, they serve a different function from their original purpose. 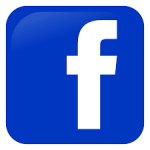 It was in 1902, during the time of administrator Ernest Bickham Sweet Escott (1857 – 1941) that the construction of houses was subjected to various regulations. 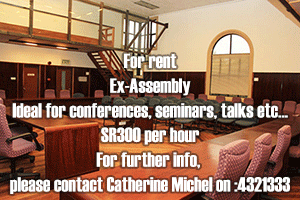 The Building Ordinance 1902 which had 47 sections was passed by the Legislative Council on August 2, 1902. By then, many timber houses which had been built many decades before were in the last stages of dilapidation danger hazards when new residential establishments were constructed. Evidently, the law prohibited the use of inflammable materials in order to preclude the possibility of a conflagration that could destroy the entire town. Therefore, after this law came into force, the inhabitants of Victoria began to use corrugated iron sheets for roofing houses instead of pandanus leaves which were not unlawful to use in construction in the suburbs of Victoria and in the districts. Any how, by the end of the first decade of the 20th century, thatched roofs went out of vogue, when more solid structures with elaborate architecture sprouted up. By then, the population of Seychelles had reached about 25,000 inhabitants, and our country earned its revenue from a thriving agricultural economy. Well, among the male populations, most of which worked as labourers on the vast coconut estates and cinnamon plantations of the colony, there were quite a few who had acquired expert knowledge in carpentry and had also inherited the tools of the trade from their grand parents. Perhaps, we owe a lot of our creole homes to those talented unknowns who have enriched the memory of our cultural heritage. 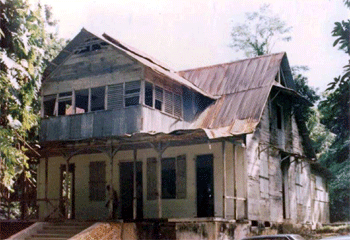 In the 1960s, those old Creole houses were homes to the third generation of families who certainly must have done some renovations and minimum modifications for the sake of space and comfort, and in the latter case, running water and electricity must have been essential amenities. At that time, most of the new houses were being constructed of cement blocks with windows of glass louvers, equipped with water-borne sanitation. During the post-independent period, the progress of modern development and the requirements of a new society must have rendered the rustic comforts of the old Creole dwelling houses completely obsolete, because, since most of them had already crumbled into ruins, they were, without regrets, demolished and replaced with masonry buildings. These products of civil engineering are of course, a heart-breaking contrast to the exquisite geometry of those early 20th century creations by builders who hardly went to school. Fascinating, isn’t it? Anyway, in the light of the absolute need for modern construction, it is indeed a predicament to imagine how we could have possibly held on to those rafters of bodamyen and those capucin ridge poles … those casuarina beams … those limestone plinths.